Luhrmann, a senior research fellow at Cambridge, investigates magic and witchcraft in contemporary London, seeking anthropological insight into the question: What draws well-educated, well-adjusted Londoners to seemingly irrational practices? In the mid-80's, Luhrmann contacted numerous magical groups in London, eventually becoming an initiate in "The Glittering Sword," a witchcraft coven, and the Hornsey Group, a magical fraternity dedicated to meditation and work with arcane "Western Mysteries." 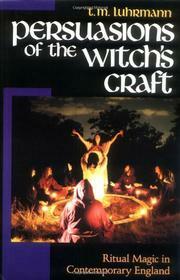 Focusing on the rites and the social interactions of these two formal groups (as opposed to self-taught witches and ad hoc groups), Luhrmann sketches a portrait of a practitioner: well-educated, middle-class, well-balanced--indeed, the only trait that seems to distinguish an English witch or a magician from the status quo is a see-saw tension between romantic, imaginative introversion and bursts of extroverted nonconformity. Witches and magicians, in short, are perfectly suited to extract creative subjective meaning from their rituals. Luhrmann explains the mysterious process through which these ordinary people (oddly, many of them are computer professionals) begin to see and think magically. This mysterious process boils down to the mechanics of becoming a specialist, she argues. A magician, like any specialist, learns to focus on certain kinds of evidence--evidence that supports efficacy of their particular practice. Like lawyers or doctors, magicians inherit a great pool of common knowledge which in turn leads them to make common, self-sustaining assumptions. In the end, Luhrmann concludes, modern witches and magicians seem to be searching for a creative and personal religious experience--hardly the wicked aims of legend. Luhrmann shows how academic rigor and trained observation can illuminate a fascinating, arcane aspect of modern life. A bit too detailed for some readers, perhaps, but well worth reading by students of the occult.